In Buenos Aires, La Boca is literally the city’s most colorful barrio, its metal-clad houses painted in bright primary hues – according to legend, paints originally salvaged (or stolen) from ships in port. It’s a neighborhood that, despite poverty and other social ills, displays a palpable sense of community. 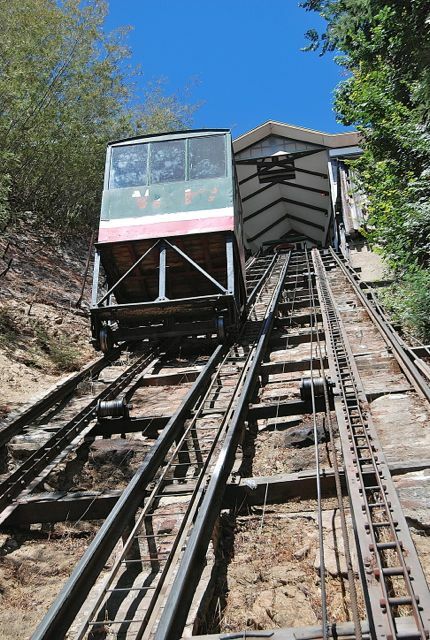 In terms of community, the same is true of Valparaíso, the gritty Chilean port that’s also a UNESCO World Heritage Site for its picturesque hills neighborhoods, formal and vernacular architecture, and its charming ascensores, the funiculars (such as El Peral, above) that link the downtown business district to the hills. It’s not quite so literally colorful but, thanks to municipal incentives, it’s becoming more so every day. That’s because, for property owners wishing to improve their houses by sprucing up their exteriors, the city will pay all the expenses except the paint itself. Down the alleyway from my B&B on Cerro Artillería, one large house is currently being painted in colors that don’t personally appeal to my hosts (or to me), but it’s still an improvement. Their place is on the list as crews become available. There are some apparent inconsistencies. In one nearby building, for instance, just one apartment owner chose to have his residence painted – on all the rest, the calamina (corrugated metal) siding remains rusted, even alongside handsome French-style balconies. 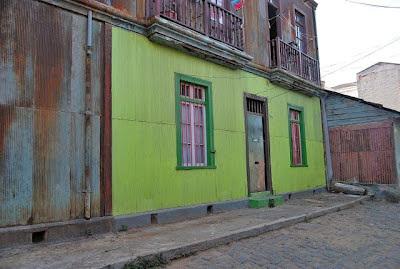 Painting in Valparaíso has complications that may not be immediately obvious to outsiders, and one of them is the terrain. 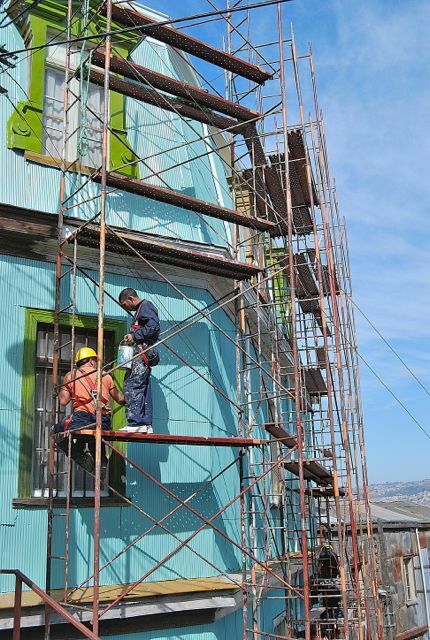 On lots that might not even be considered buildable in other cities, painters must erect several stories of scaffolding before even beginning the prep work. I have no fear of heights, but it often looks precarious to me, especially in a seismically active area that didn’t suffer much in the massive 2010 earthquake. Valparaíso did, though, experience a major earthquake of its own in 1906, just a few months after the famous San Francisco earthquake and fire. It’s not just paint that’s transforming the city’s hills. 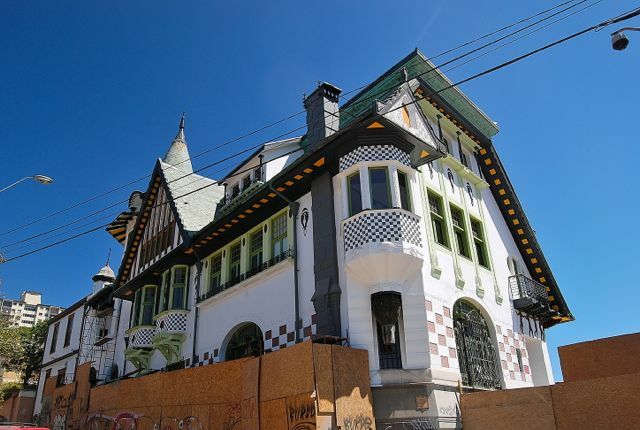 In the prime tourist areas of Cerro Alegre and Cerro Concepción, there’s also plenty of residential scaffolding, but the number of boutique hotels and gourmet restaurants continues to grow, the streets are undergoing improvements, and the restoration of the art nouveau Palacio Baburizza (pictured above) – site of the city’s fine arts museum – is nearing completion. When all that ends, the “Pearl of the Pacific” may not exactly glisten with polish – it’s a little too rough around the edges for that – but it will shine in the sun, at least as soon as the morning fog clears. As I much as I enjoy Valparaíso, there’s one thing that bothers me about the city - after night falls, it must be the “Car Alarm Capital of Chile.” As rumbling trucks and lumbering buses downshift to climb the hills, the alarms are, if not quite constant, a frequent sound that carries through the night. Even then, it’s a more interesting and rewarding place to stay than nearby Viña del Mar, the beach resort favored by the overwhelming majority of Chileans.